The University of Maryland’s new Physical Sciences Complex is an instant architectural landmark with its shimmering elliptical atrium, and with its official opening on April 23, 2014, the state-of-the-art research building is poised to become a landmark of scientific achievement. Designed to create ideal conditions for scientific innovation—precision in the laboratory and freewheeling conversation in the corridors—the Physical Sciences Complex is one of the largest building projects in the university’s history. Constructed with a $115.7 million contribution from the state of Maryland and $10.3 million from the federal government’s National Institute of Standards and Technology (NIST), the 160,000-square-foot building houses nearly 50 laboratories, more than half of which were constructed to the most stringent technical standards. This gives the university one of the nation’s largest expanses of top-quality research space, which already is attracting top scientists who will collaborate on groundbreaking discoveries about the universe, quantum science and the battle against disease. 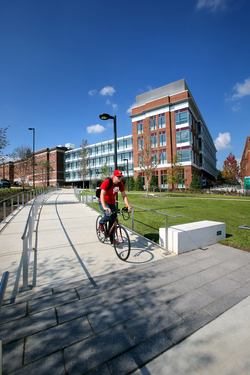 Occupying the new space are the university’s physics and astronomy departments; the interdisciplinary Institute for Physical Science and Technology; and the Joint Quantum Institute, a partnership between NIST and UMD. “The partnership between NIST and the University of Maryland, going back some 40 years now, is one of our oldest, longest running, and most productive collaborations, but the new Physical Sciences Complex is a new high. We’re very pleased to have played in part in the creation of this outstanding research facility,” said Patrick Gallagher, director of NIST and under secretary of commerce for standards and technology. The capabilities of the Physical Sciences Complex will enhance UMD’s leadership in theoretical, experimental and applied quantum science research, placing the university firmly at the leading edge of what is likely to be the next great scientific revolution. 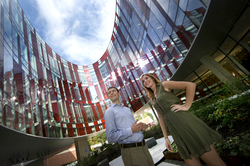 Fifteen years in the planning, and designed with extensive input from faculty members in the College of Computer, Mathematical, and Natural Sciences, the facility reflects the university’s commitment to collaborative research of the highest technical standards. “The new Physical Sciences Complex is a key component of our university's strategy to work across disciplines and with federal and state partners to create the innovations of tomorrow and educate the next generation of science and technology leaders,” says Jayanth Banavar, dean of the College of Computer, Mathematical, and Natural Sciences. Today’s experiments in quantum science and other technically demanding fields require precise control over conditions such as temperature, humidity and vibration. To accomplish this, the Physical Sciences Complex is built of reinforced concrete, which is stronger than steel. Laboratories’ temperatures are controlled to within .5 degree Celsius (.9 degree Fahrenheit); humidity is controlled to within 1 percent; and laboratory walls are isolated to minimize vibrations. Two levels of underground laboratories, as much as 55 feet below the building’s plaza, were designed for researchers working with atoms and lasers and were built to the exacting standards of NIST’s Advanced Measurement Laboratory, one of the most sophisticated labs in the world for quantum physics research. The underground setting minimizes vibrations, electromagnetic variations and radiofrequency interference. To further reduce the chance of interference with delicate instruments, telephone connections are fiber optic and electrical wiring is carried through special insulated conduits. Anti-static flooring helps control static electricity. The Physical Sciences Complex’s most striking architectural feature is a wide elliptical atrium. Shaped to reflect the orbits of planets and stars, the atrium soars through all four above-ground levels. The ellipse is lined with 953 panes of clear and red glass in a checkerboard pattern and opens the building up to the sky, flooding interior spaces with light. Corridors around the ellipse are extra wide and furnished with comfortable armchairs and couches to serve as gathering places for students and faculty. The use of natural light is among the design features that earned the building Leadership in Energy and Environmental Design (LEED) gold certification from the U.S. Green Building Council. 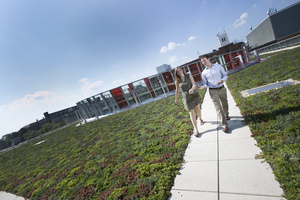 Other features include energy-efficient fixtures, materials that come from rapidly renewable resources or include recycled content, reduced water use, a green roof, and plantings that capture stormwater runoff from paved surfaces and filter it into the soil. At the base of the ellipse, the Gluckstern Garden honors the memory of Robert L. Gluckstern, who was a UMD physicist and former chancellor of the University of Maryland (this position is now called president). The glass-walled lobby has a café and views of the garden and the plaza surrounding the building. University officials hoped the new facility would boost recruitment of leading scientists, and this is already proving true. This year two top experimental condensed matter physicists joined the Joint Quantum Institute, which also has recruited a higher number of promising young graduate students to attend UMD this fall than in years past. The building is also attracting stars of a different kind. Its striking architecture earned it a role in an upcoming episode of “Veep,” the Emmy-award-winning HBO comedy starring Julia Louis-Dreyfus, which airs April 27, 2014.